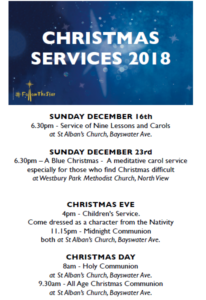 6.30pm – Service of Nine Lessons and Carols – at St Alban’s Church, Bayswater Ave.
Christmas can be a painful time for some: for those who are missing a loved one, for those who are reminded of difficult times, for those for whom life is difficult right now. Amidst the jolly music, the parties and the family gatherings it’s hard to find space for feelings which don’t seem to be welcome amongst the lights and the tinsel. ‘A Blue Christmas’ is an opportunity to acknowledge our sadness; to reflect on the Christmas story in a more meditative way and to know that we are not alone. both at St Alban’s Church, Bayswater Ave.
8am – Holy Communion at St Alban’s Church, Bayswater Ave.
9.30am – All Age Christmas Communion at St Alban’s Church, Bayswater Ave.